Yoshida Yasuyuki is an archaeologist working on a number of research projects that investigate Japanese prehistoric Jomon culture, Southeast Asian prehistory, and archaeology and contemporary society. 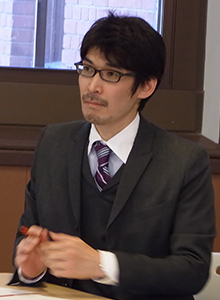 He is concurrently based at the Centre for Cultural Resource Studies, Kanazawa University, and at the Kanazawa University Graduate School as project associate professor to coordinate the Graduate Programme in Cultural Resource Management, Human and Socio-Environmental Studies. During his year as a Handa Archaeology Fellow, he hopes to promote current research on the three types of characteristic ‘richness’ of Jomon culture and Japanese archaeology to an international audience. Jomon has been regarded as an affluent hunter-gatherer culture within Japanese domestic discourse. Recently, ‘The Power of DOGU’ at the British Museum in 2009 supported by the Sainsbury Institute was considered to be a tremendous success in demonstrating the richness of Jomon culture through its distinctive clay figurines, dogū. He intendeds to further develop the public’s interest by introducing broader aspects of prehistoric Jomon culture underpinned by his current research. Japanese archaeology has significantly benefitted from government driven archaeological heritage management initiatives since the end of the second World war, particularly in rescue archaeology and post-excavation research system. As a result, Japanese Archaeology has been accumulating massive data. The research will explore how the collected data could be used to contribute to an international archaeology theory and discourse. One of Yoshida’s current research focuses is on ‘Archaeology and Contemporary Society’. Here, he studies how ‘the Jomon’ (includes archaeological investigation in the form of sites, artifacts, written and oral interpretations regarding Jomon period) has become an important referent, interlocutor, or actor in a variety of social movements in Japan today, for example in environmentalism and revitalization of rural areas. Through analysing the relationships, he is seeking ways to contribute to the broader realm of social sciences and humanities beyond archaeology.